It comes to existence in 1993 from the unification of the previously separate community centre, town library and cinema. it is called the institute of civilization. In 1999, the name library was given to its name, so it could be added to the list of public library. its task is to run the Túrkeve TV and the technical preparation of the Túrkeve Újság. Community centre, Túrkeve, Táncsics M. u. 16. Local Library, Túrkeve, Petőfi tér 2-4. Korda Sándor Cinema, Túrkeve, Széchenyi u. 29. Túrkeve TV and Túrkeve Újság, Túrkeve, Táncsics u. 3. The Community centre is located in the 200-year old hall. there are four rooms for cultural events. there is one room, which is the place of KUN embroidery and there is a theatre room and two smaller rooms. The library was built in the 80s. its facilities suit the present – day wants. it has got an adult and a children department. it is equipped with computers, printers, photocopiers. Visitors have the opportunity to use the Internet for a little amount of fee. 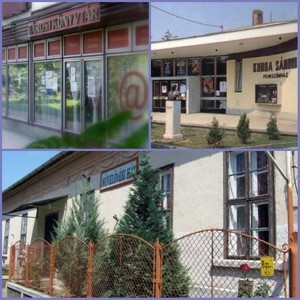 The Korda Sándor Cinema does not exist anymore. there are no public showing the films. Local cultural events take place in its theatre room. There is a big hall, a 360 – seat theatre room and there are three smaller offices. The Túrkeve TV joined the Institute in 2007, the Túrkeve Újság in 2008.